As a physician, my main focus is keeping people healthy. Given the availability of modern medical care and sanitation techniques, my job is easier than it was for my predecessors one hundred years ago. Like many folks in today’s society, I have been spoiled by high technology, mass production, and Big Pharma and feel that good health is just something that is due to me, and that I don’t have to think about it anymore than I think about my next breath. Yet, in uncertain times, can we be assured that our system for obtaining clean water and disposing of human waste will always be in place? From the aftermath of a severe storm to a complete societal breakdown, the answer is no. When our infrastructure is working, we generally are able to provide fresh clean water for drinking and provide food for the table that is unlikely to be contaminated. We also have ways to flush waste from our immediate surroundings. When that infrastructure is damaged, we will be easy prey for infectious disease. One only has to look back a short time to the earthquakes in Haiti and the subsequent Cholera epidemic there to know that this is true. A growing number of people are now storing food for use in tough times, and quite a few are providing for the common defense by accumulating means of protecting themselves and their families. To their credit, many are also putting away medical supplies and learning skills to deal with injuries and common medical complaints. Few, however, have given a great deal of thought to how they will maintain a sanitary environment for their family or survival group in times of trouble. And this is despite daily news reports of hundreds or even thousands of deaths due to this issue in many third world countries. Here is a pearl of wisdom from Ol’ Dr. Bones that you can take to the bank: If you can keep your family clean, your water sterilized, your food properly prepared and your waste effectively disposed of, you will do more to keep your loved ones healthy than anything I, as a physician, will be able to do in a collapse situation. Your gauze bandages, your number 10 cans of beef Stroganoff, and your closetful of ammunition will be of little use if you allow infectious disease to run rampant in your people. When electrical power is lost due to a storm, water utilities cannot operate the pumps that maintain water pressure in the pipes that travel to your home. This pressure is one way water utilities ensure that your water is free from harmful bacteria. When the pressure is lost, a boil water order is established by the local authorities. In our neck of the woods (South Florida), lessons have been learned the hard way by various hurricanes. The result was the outfitting of water treatment and distribution facilities with generators, but not every town or city in the country has this system in place. 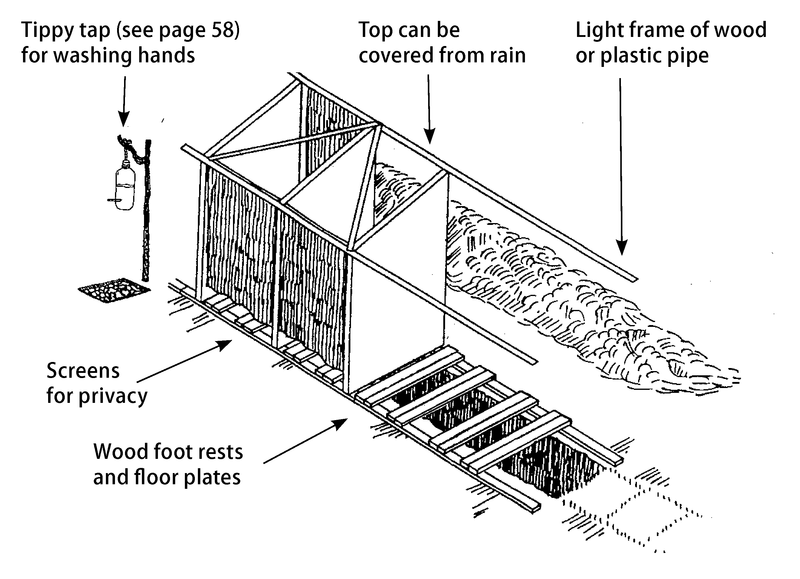 Therefore, human sewage may be a big problem in the aftermath of a storm or a complete collapse. If the water isn’t running, a community without a ready supply will have a nightmare on their hands after as little as three days. There are various examples of this in the recent past. In the grand majority, people were clueless as to what appropriate planning was with regards to simply flushing a toilet. After filling whatever porcelain or ceramic options they had, they proceeded to pick rooms where they would defecate and, as a result, their homes were uninhabitable in less than a week. Here’s where some simple planning pays off. If you have access to water, even water unfit to drink, you can have a working toilet by filling the tank with water before flushing or by pouring a couple of gallons directly into the toilet bowl. This will trigger the siphoning action of the plumbing and send your excrement on its merry way. This works well if you have a septic tank, although probably not forever. If you have municipal sewer lines, you have a sewer line known as a “lateral” that goes from your home to the sewer main. Find out if the sewer main is down or not. If the main line is functioning, you can use the process in the above paragraph. 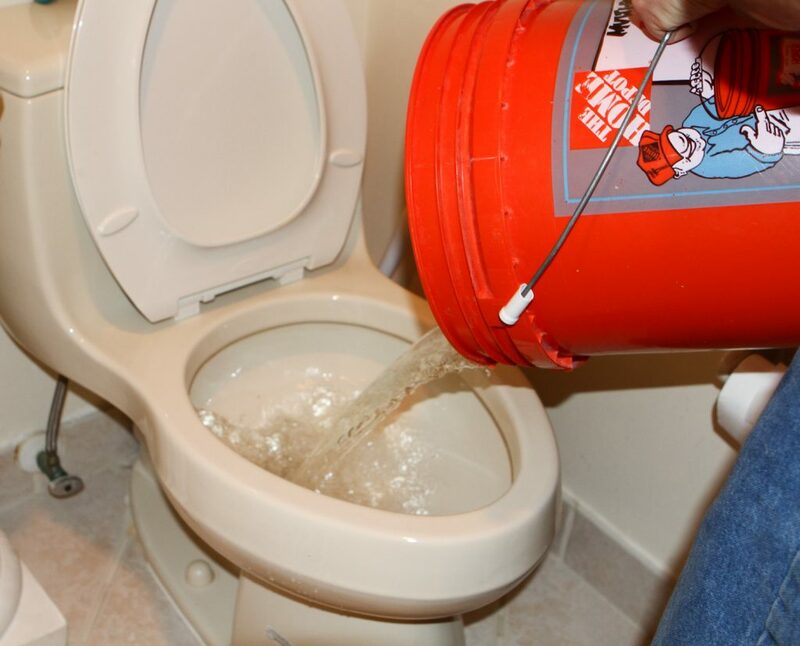 If the sewer main is down or blocked, the act of flushing the toilet will eventually back up sewage into the rest of your plumbing (known as backflow). There are backflow prevention valves that can be installed or might already be there; try to find out if you have them. So how would you deal with human waste when you have no water to spare for the purpose? 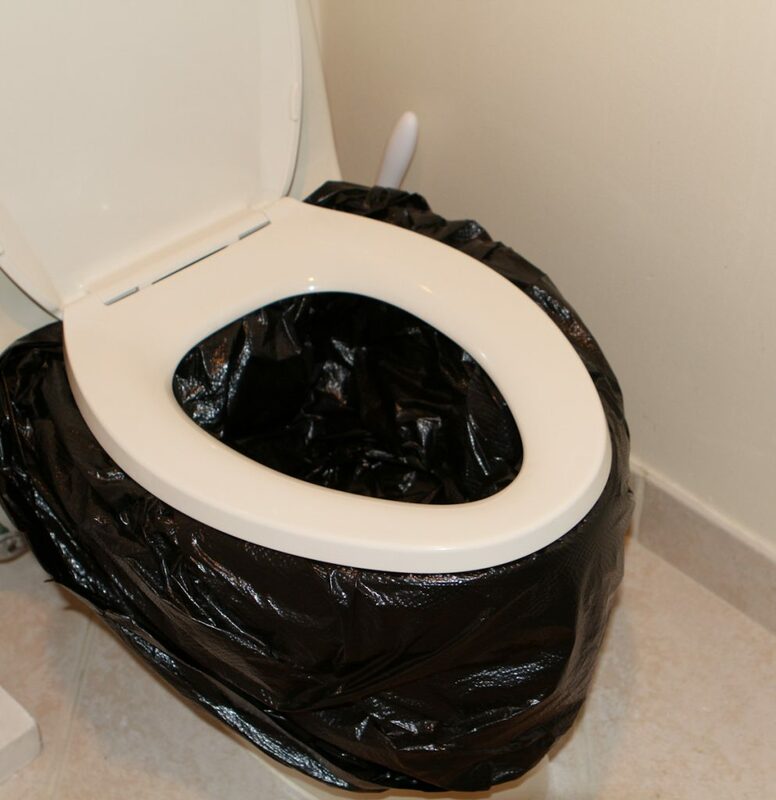 If you are in your home, empty your toilet as much as possible; then, place two layers of garbage bags (the sturdier the better) inside and lower the lid to hold them in place. Once you have done your duty, pour some sand and some bleach solution over the waste; this will help deodorize. If you’re a cat person, you have a head start as you’ve probably stored away some kitty litter to use. Also, consider some of the commercially produced powders that are on the market. 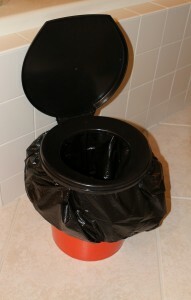 After several uses, it will be clear that it’s time to dispose of the waste, which you already have conveniently bagged. Whatever you do, don’t allow flies to get near it, as they will have no compunction to avoid landing on tonight’s dinner afterwards. It might be wiser to move this bodily function outdoors, as our ancestors did. Here‘s where a 5 gallon bucket from Home Depot or Lowe’s comes in handy. Line it with the same 2 garbage bags (have you stored plenty of these in your preps?) and place your toilet seat, a couple of short length 2 x 4s, or even a commercially produced top made just for that purpose on top, and you’re good to “go”. Use sand, dirt, kitty litter, or even quicklime along with some bleach solution until the bag is half full or so. There are even self-composting toilets that are manufactured especially for power-down scenarios, but I have no experience with them. If you do, please let me know how they worked out. 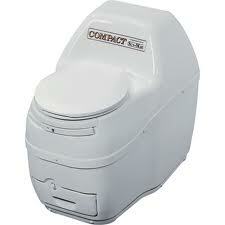 Of course, there is the outdoor latrine, either single or multiple use. For those on the move, a single hole dug when the need arises will work, if covered effectively and some important rules are followed (see below). 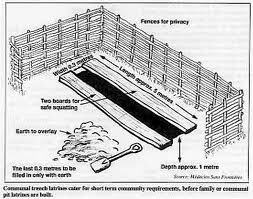 For the long term, you will want to dig a trench latrine A trench latrine is basically just that, a trench dedicated to waste that can be utilized multiple times. 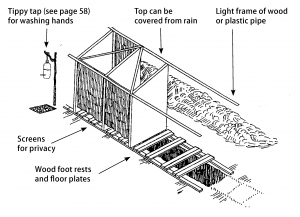 The dimensions of the latrine will depend on the length of time it is needed and the number of people in your group. For a small group, make it 18 inches wide, at least 24 inches deep and at least several feet long. Keep the dirt from the trench in a pile next to it with a shovel, and make sure you cover up the waste after each use to discourage flies, etc. As an aside, when I was traveling in the third world some years ago, the public restrooms consisted of a hole in the ground that you straddled and bent over. Not very dignified, but it did the job. Consider a longer trench and some kind of partition sheet if your group is big enough to have more than one person utilizing it at a time. Although, as the survival medic in a collapse situation, you might consider this article not part of your job description, it really is. You are the Chief Sanitation Officer, and it’s your duty to make sure that you keep conditions in your retreat as healthy as possible. If you haven’t made plans for sanitation, you’re not as prepared as you have to be, to keep your family healthy in tough times. 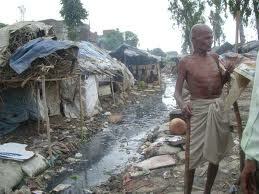 More on sanitation as it applies to health in collapse medicine in the near future.